Packer Butte is located in the Bennett Hills, about halfway between Mountain Home and Fairfield. It sits on the western fringe of the Camas Prairie, not far from highway 20. It’s not a spectacular mountain by any means, but it’s a good option if you’re looking for a place to stop and stretch your legs on the way back from climbing a real mountain. I was doing a short snowshoe climb of The Cross and Avalanche Peak, and wanted to find another quick climb to do on the way home if I had time. After scanning Dan’s peak list on IdahoSummits, I came his trip report for Packer Butte, and it seemed like a good option. I pulled off the highway at the first road west of Cat Creek Summit and began hiking up the snowbound road. The snow was crusty and firm, but I strapped snowshoes on the back of my pack just in case. Snow was beginning to fall, and visibility was low. Not the most appealing conditions, but I figured that would add to the adventure. After about three-quarters of a mile, the road veered to the east, and I headed cross-country to the west. Visibility was very low, and I could barely make out the peak in the distance. But there was only one way to go, up. I made my way up the east face of the peak, occasionally having to kick steps in the crusty snow. 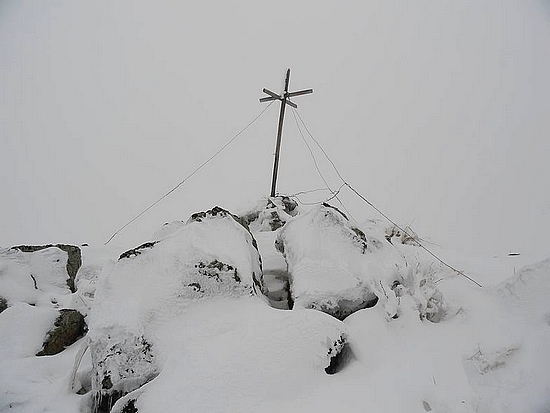 As I approached the summit, the wind was howling as the summit marker came into view. I snapped a few photos, but didn’t stay long since it was pretty cold and windy. Instead of backtracking to the road, I decided to make a loop of it, and headed northwest along the “summit ridge”. I ended up sticking to the ridge for a while, passing a few cool rock towers on the way back to the car. Not much in the way of views due to the weather, but still a nice quick adventure. Map of the route, I went clockwise. 2.5 miles with 1000' elevation gain round trip. Hiking up the snowbound road. Packer Butte from the east. Rock formations on the ridge I descended.